One of the world's leading suppliers of advanced CAD/CAM solutions, Delcam, has released an update for 2015 version of its PowerSHAPE Pro CAD for CAM system, for modelling, manufacture and reverse engineering. The new release includes improvements in direct modelling, surface modelling and reverse engineering, plus support for data from Creaform HandySCAN hand-held scanners. PowerSHAPE Pro has often been lauded for the strengths it has always had on its surface-modelling capabilities. These capabilities have been further improved with new dynamic point editing. Multiple points, either along a single curve or picked from multiple curves, can now be selected and moved, with real-time updating of the model. This makes styling of free-form shapes easier and quicker, and also speeds up modelling for manufacture tasks like removing undercuts from tooling designs. PowerSHAPE Pro has also been made faster and easier in the ability to morph complete models into a new shape. One key application for this option is in compensating for springback in press tools or warpage in moulded products. 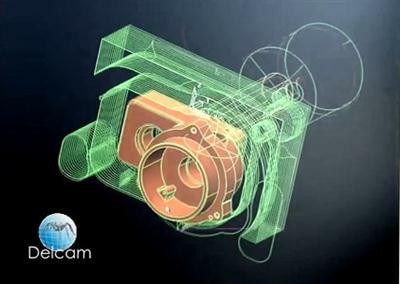 The user can alter CAD directly based on scan data from a sample part collected as a point cloud or as a triangle mesh, with a choice between either updating the CAD model of the part to match the as-produced item or adjusting the tooling design so that it can produce parts matching the original CAD data. The main enhancement to PowerSHAPE Pro?s reverse engineering functionality is a more automated method for capturing cross-sections through a mesh. The software now fits lines and fillets to the cross-section where it can, with the user able to control the tolerance used. This method uses the mesh as a guide instead of treating it as exact geometry with the priority of capturing the design intent rather than ensuring a precise fit to the scan data.